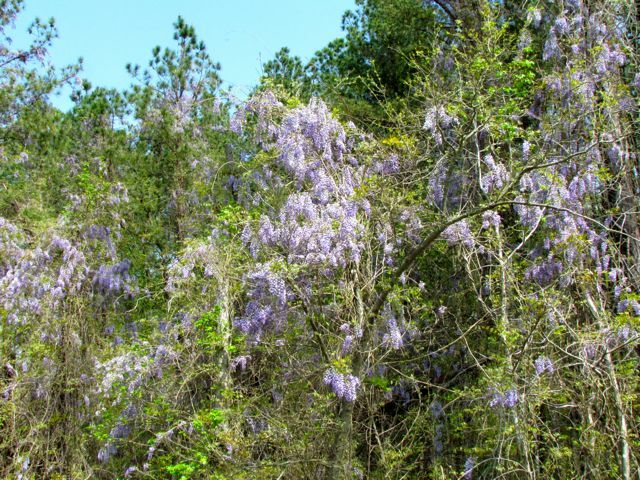 I call the bloom period of the invasive exotic Chinese Wisteria (Wisteria sinensis) the Purple Plague, because the long, grape-like clusters of blooms are purple, and because the bloom period of this invader visually emphasizes its plague-like effect on our southeastern US woodlands. I’ll concede that the blooms are not ugly, and many folks like their overpoweringly sweet fragrance, although I’m not a fan. It was the aesthetic appeal of this plant that got it here. Many southerners fell in love with it, draping it over arbors, sides of houses, and training it into artfully shaped waterfall-like forms in their front yards. If Chinese Wisteria stayed where it was planted, I would not object to its existence in southeastern yards and gardens. But it doesn’t, not by a long shot. Actually, shot is a good word here. You see, the seed pods of this vine are long, bean-like structures. On late autumn days when atmospheric conditions are just right, the pods split open with a resounding crack that sends seeds flying explosively in all directions. I’m told by folks who live near heavily invaded forests that when the pods explode, it sounds like rapid gunfire that goes on and on and on, until all the pods have expended their loads. See how the wisteria vines ramble and climb over everything? Like the evil invader Japanese Honeysuckle (Lonicera japonica), vines of Chinese Wisteria climb over every plant in the forest, creating impenetrable tangles of vegetation that destroy any chance for a healthy ecosystem in such areas. Chinese Wisteria vines can grow quite large and woody. The extra biomass, especially when vines are leafed out in summer, can add enough weight to burdened trees to make them much more likely to fall or break during wind events created by thunderstorms and hurricanes. During winter ice storms, when one burdened tree falls, those connected to it by this invasive vine are also likely to fall, pulled down by the vines tangling them together. As with Japanese Honeysuckle, the sprawling masses of tangled vines, trees, and shrubs, create perfect highways for predators like black snakes, raccoons, and other climbers. In such areas, it is vastly easier for these predators to access and devour eggs and nestlings of many of our native songbirds. In my opinion, there is never a good reason to deliberately introduce invasive Chinese Wisteria into a landscape. It will not — not ever — remain only where you plant it. It will — without question — escape into nearby woodlands, where it will destroy the integrity, beauty, and health of these small forests that are essential to native wildlife and plants. And there’s a native alternative to this invader: American Wisteria (Wisteria frutescens). It is not as flamboyantly showy as the Chinese invader, but it performs the same functions — covering arbors, for example, just as beautifully with similar flower clusters. Most importantly, our native Wisteria vine does not escape and destroy our forests — reason enough to plant it instead, if you ask me. I will freely admit that Chinese Wisteria is not the most damaging invasive exotic plant species in my region of the country. But it’s blooming and very visible right now, so I think it serves as perfect symbol for North Carolina’s second annual observance of Invasive Species Awareness Week, which runs from April 1-7 this year. Many conservation-related organizations plan activities during this week that highlight this issue. The site links you to a calendar of events occurring throughout the state this week. Many botanists and ecologists believe that invasive species represent one of the top two threats to our native ecosystems. The other threat is habitat destruction due to land clearing. These two issues are related. As more land is cleared, smaller tracts of native forest remain. These smaller tracts are much more easily overtaken and destroyed by exotic invasive species. If you live and garden in North Carolina, I ask that you take a few moments to visit this link to the Web site of the North Carolina Exotic Pest Plant Council to learn more about invasive species in our state. If you live in a different state in the southeastern United States, visit this link to the Southeast Exotic Pest Plant Council. The home page includes links to all the member state organizations, so you can find out what they’re doing about invaders in your state. As a life-long gardener in the Piedmont region of North Carolina, I can personally attest to the transformation of my native woodlands by invasive exotic plants. When I was child roaming Piedmont woodlands in the 1960s, Japanese Honeysuckle was not strangling the trees. Autumn Olive (Elaeagnus umbellata) and Japanese Stiltgrass didn’t overwhelm my beautiful woodlands until a decade or two ago. Same for Chinese Privet (Ligustrum sinense). The invaders are coming faster now and establishing themselves much more quickly. Anyone who cares about the long-term health of our native ecosystems should be deeply worried. I know I am. Please educate yourself about these invaders, learn about the many lovely native plant alternatives to the dangerous species. Much good information is out there. Besides the Southeast Exotic Pest Plant Council site, try the information-packed Web site of the North Carolina Botanical Garden. Here’s a link to their list of exotic invasive plants to avoid. And here’s a link to the page where they offer suggestions for native plant alternatives. With just a bit of effort, your garden and yard can become part of the solution to this growing problem. Please consider joining me in this battle against alien invaders. Together we can fight the Purple Plague, and restore a healthy balance to our native landscapes. This entry was posted on April 1, 2012, 10:42 am and is filed under Invasive Exotic Species, Native Wildlife, piedmont gardening. You can follow any responses to this entry through RSS 2.0. You can leave a response, or trackback from your own site. I once worked for a lady who had Chinese wisteria growing on a pergola that was attached to her house. Each week I had to open a second floor window and attack it from above with a pole pruner so it wouldn’t tear the cedar shakes of the side of the house. I love it, but I wouldn’t grow it here at my house unless I had a spot well away from trees and buildings. I don’t have much experience with the native wisteria. 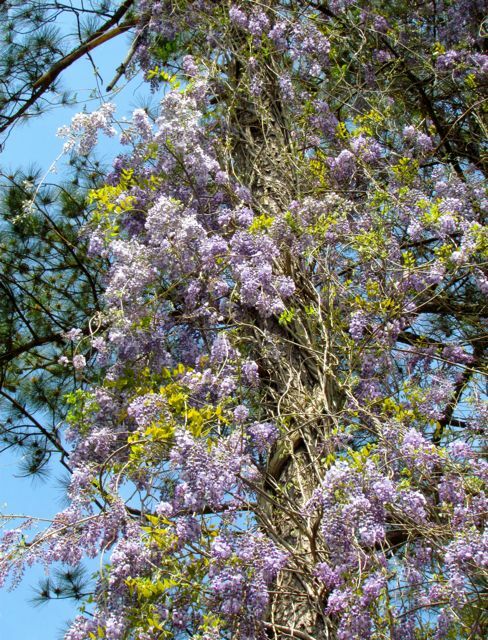 According to the Native Plant Database maintained by the Lady Bird Johnson Wildflower Center (http://www.wildflower.org/plants/result.php?id_plant=WIFR), the native Wisteria only occurs naturally as far north as Massachusetts, so it may not be hardy in New Hampshire. However, because most arbors and pergolas tend to be in more sheltered locations near houses and other buildings, it might be worth experimenting with this alternative to Chinese Wisteria. Do you see the Asian species escaping into your woodlands? If not, perhaps your cold, snowy winters are preventing an invasion. No, I’ve never seen a wisteria of any kind in the wild, come to think of it. Just pulling down trees and buildings. I’ll have to do a little research on it. I sure would love to have one. Our first spring in eastern NC, I was enchanted by the fragrance and color of what I assumed to be some wild purple flowering vine in the woods beyond our fenceline. I now realize it is Chinese Wisteria and is spreading rapidly. So apparently the “damage” is already done, correct? Nothing we can do about it? Welcome, Kim. 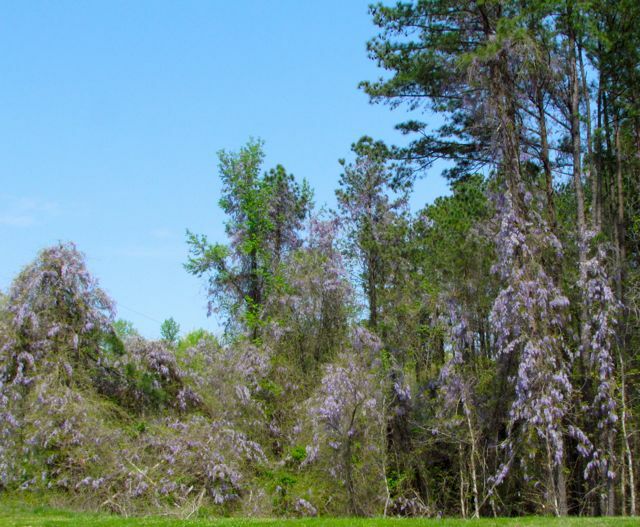 It is possible to fight Chinese Wisteria, but it is a multi-year effort, and if it is widespread, it will require the cooperation of all landowners. For large vines, the fastest way to make an impact is to cut the woody vines at the base of trees where you can reach them, then with a small paintbrush, pain the cut surface of the vine going into the ground with a full-strength herbicide formulated as a “brush killer.” The vine pulls the herbicide into its root system and poisons it. However, large vines have large root systems, so usually it takes several years of re-cutting and re-applying when new growth emerges. Thanks for stopping by!